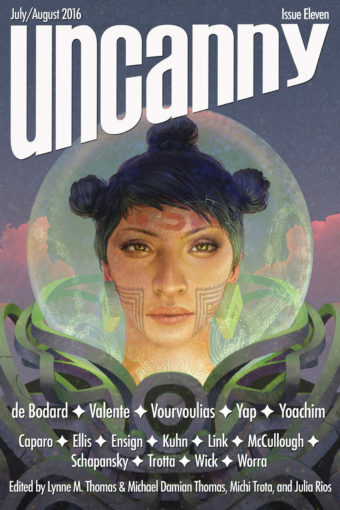 Welcome to Uncanny Magazine Issue Eleven! All of the content will be available for purchase as an eBook (PDF, EPUB, MOBI) on July 5, 2016. The free online content will be released in 2 stages—half on July 5, and half on August 2. Featuring all–new short fiction by Aliette de Bodard, Sabrina Vourvoulias, Caroline M. Yoachim, Catherynne M. Valente, and Isabel Yap, reprint fiction by Kelly Link, nonfiction by Sarah Kuhn, Erika Ensign and Steven Schapansky, Sigrid Ellis, and Kelly McCullough, poems by Jessica P. Wick, Bryan Thao Worra, and Ali Trotta, interviews with Sarah Kuhn and Sabrina Vourvoulias, and Antonio Caparo’s “Those Who Came First” on the cover. Episode 11A (July 5): Editors’ Introduction, Aliette de Bodard’s “A Hundred and Seventy Storms,” (as read by Erika Ensign), Jessica P. Wick’s “Good Neighbors”(as read by Amal El–Mohtar), and an interview conducted by Deborah Stanish. Episode 11B (August 2): Editors’ Introduction, Isabel Yap’s “An Ocean the Color of Bruises” (as read by Amal El–Mohtar), Ali Trotta’s “The Persecution of Witches” (as read by Erika Ensign), and an interview conducted by Deborah Stanish. Antonio Javier Caparo grew up in Cuba and graduated as a Graphic Designer in the Superior Institute of Design in Havana. It was there that he discovered a book at the Institute’s library: Guide to Fantasy Art Techniques including interviews to some of the greater artists at the moment: Jim Burns, Chris Foss, Boris Vallejo, Syd Mead and that marked a path to follow from that moment on. Much of his early career was spent in graphic design but he always felt passion for other worlds, magical characters, metaphorical stories. Soon he decided to devote himself to illustrate both traditionally and digitally, trying to turn every of his works in a conceptual piece with a story behind it. 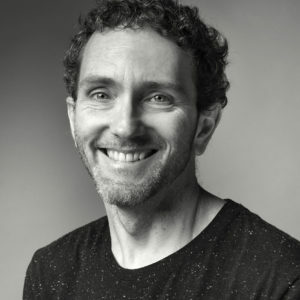 His illustrations regularly appear in magazines and children and young readers books in the US and Europe with clients that include Harper Collins, Hyperion Books for Children, Simon & Schuster, Tor Books and many others. He is also passionate about animation and comics. He currently lives in Montreal, Canada with his wife and his daughter.